The Lord Nelson Hotel, on Hamilton Terrace in Milford Haven, was previously called the New Inn. It was renamed in 1802 when Admiral Lord Nelson made a speech there whilst visiting the town with Sir William Hamilton and Hamilton’s wife, Emma. 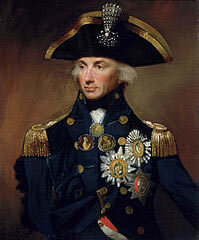 Nelson (1758 – 1805) had risen rapidly through the ranks of the Royal Navy, obtaining his first command in 1778. His reputation as a tactician, as well as for his personal bravery, grew through his involvement in the American War of Independence and the French Revolutionary War, peaking after his victory over the French at the Battle of the Nile in 1798, after which he was greeted as a hero everywhere he went. So how did Nelson, the rock star of his time, come to be in Milford Haven? Nelson had first met the Hamiltons in 1793, when Sir William held the post of British Envoy to the Court of Ferdinand 1 of Naples and Nelson arrived there to gather reinforcements for the naval battle against the forces of Napoleon Bonaparte. Nelson returned to Naples in 1798, a living legend after his famous victory over the French at the Battle of the Nile but ill and prematurely aged. The Hamiltons invited him to stay at their house, where Emma nursed him back to health and their famous affair started – apparently with Sir William’s approval. In 1800 Sir William’s retirement from his post coincided with Nelson’s recall to England and the three returned to their homeland together, arriving in Great Yarmouth in November. Nelson was appointed second in command of the Channel Fleet at this time, and subsequently saw further action in the Baltic, including at the Battle of Copenhagen in 1801 where he famously raised a telescope to his blind eye and said that he couldn’t see the signal instructing him to withdraw from the battle. It was in the summer of 1802 that Sir William Hamilton, Emma and Nelson set off on a trip to inspect Sir William’s estate in Wales, which included land at Hubberston and Pill which he had inherited from his first wife. That was how Nelson came to be in Milford Haven, where the New Inn was renamed in his honour. The trip turned into something of a grand tour, with cheering crowds lining the way wherever the three went and numerous celebratory banquets being held. All this came to an end, however, and Nelson was called back to active service when the truce with France was broken. Sir William Hamilton died in 1803 and Emma might have expected to marry Nelson now that she was free to do so but he didn’t return from his campaign until August of 1805. Just three weeks later Nelson was called back to sea to engage the French fleet near Cape Trafalgar, off the coast of Spain near Cadiz, where he received a fatal wound and died on 21 October. Emma died in poverty in 1815.